IronAxe is a high-end Physical Modeling simulation of one of the most popular and loved electro-acoustic instruments : the Electric Guitar. Build your custom Stratocaster© or Telecaster© guitar, choose Pickups type, number and position, set the Tone knobs to get the right sound, select the Plectrum hardness or pluck a String with fingers at any point along its lenght. 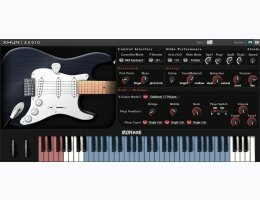 Finally take real-time control of all this (and much more...) using a MIDI Keyboard or a real - natively supported - MIDI Guitar. IronAxe will bring in your next Productions the sound and feel of a real Electric Guitar. And the included full set of analogue modeled Stompboxes, legendary Amp/Cabinets and Room Simulation, make IronAxe a perfect tool for advanced guitar sound designing, without the need of additional (and expensive) external software/hardware units. A full electro-acoustic setup, just at your fingertips.